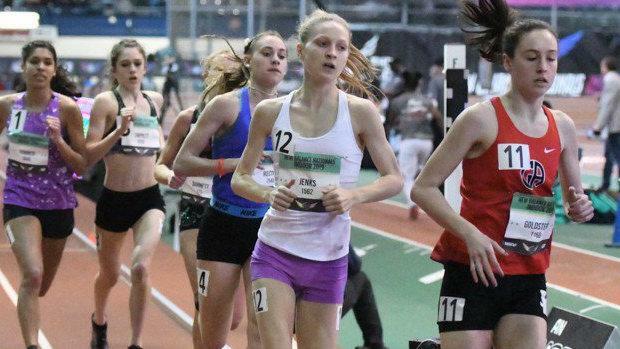 Lucy Jenks of Newton South finished 5th in the championship girls mile race with a PR of 4:45.93 at New Balance Nationals. Jenks was one of two All-American distance runners produced by the state of Massachusetts. Grace Connolly of Natick finished 5th in a deep and fast girls 2 mile run with a time of 10:19.88, which just a second off her current PR. Connolly also teammated up with her sister Kate to help the Natick girls earn All-American honors in the distance medley relay with a third place finish of 11:45.63. In the girls pentathlon, Jada Johnson of Sharon showcased her incredible versatility and athletic ability with a 3rd place All-American finish in the girls pentathlon talling 3,735 points. Against her multi-event competition, Johnson ranked 1st in the long jump, 3rd best in the 60 hurdles, 3rd in the high jump, 3rd in the shot put, and 8th in the 800 meter run.